What's more frustrating than a harsh interruption in the middle of work? Surely, having an jammed stapler is at the top of the list. 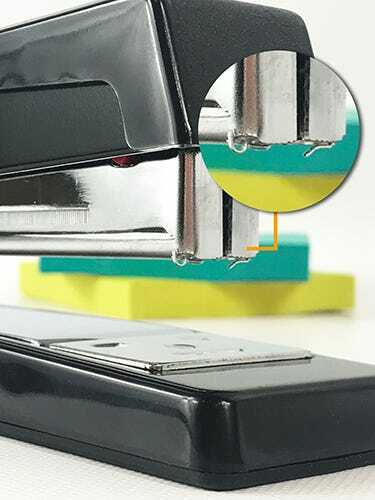 While our staplers are specially designed to bring high-quality stapling and feature No-Jam technology, sometimes things happen. There are various ways in which you can jam a stapler. Don't panic! We'll introduce you to those, along with just how to unjam a stapler. First, to steer clear of pesky jams, be sure to note each individual stapler's maximum sheet count. If a stapler is made to staple 20 or 40 sheets of paper, and you try to staple anything above, you'll have a jammed stapler on your hands. Same goes for when you try to tack tough materials, such as cardboard, with an office stapler. Strictly use heavy duty staplers or automatic staple guns for tough, on-site jobs, and use any of our office staplers for, you guessed it, in the office! If you know your stapler did not staple all the way through your document and is stuck mid-staple, don't keep stapling in the same location. It is likely you will jam it further. So, how exactly do you unjam a stapler? 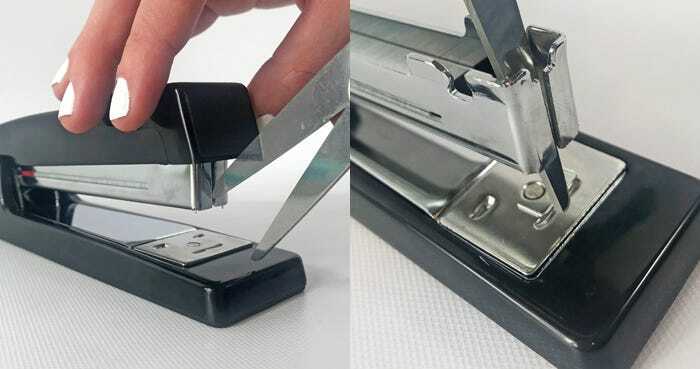 Using any sizable tool or nearby accessory, try to fish out the jammed staple through the "front teeth" of the stapler. You could also unjam it by opening it up and trying to grab the staple from the top-load magazine. The photos below demonstrate this tactic with each tool. 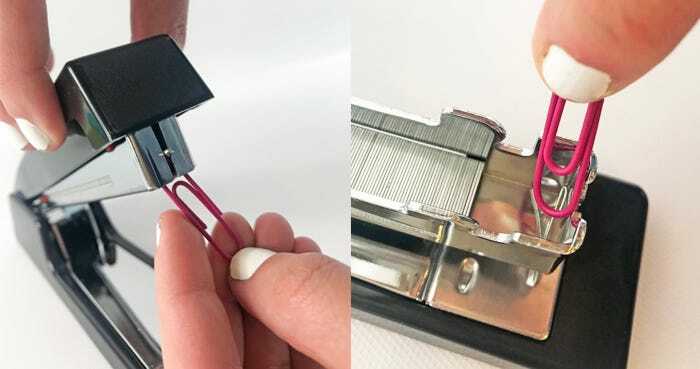 Another method includes trying to staple a single piece of paper while the unit is jammed. This could possibly force the jam outward, clearing the unit. Various options exist as multiple tools can do the job! 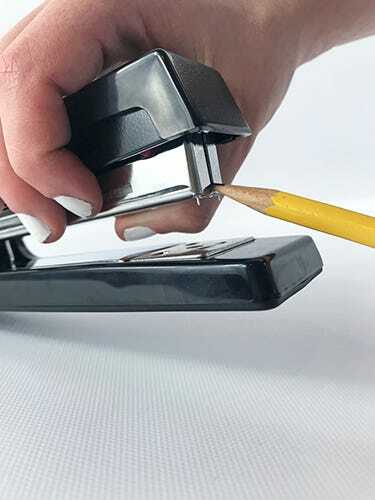 We've shown above that using a pencil to unjam a stapler is suitable; however, we never recommend trying to fix the issue by sticking your fingers into the unit. The following items may be used! 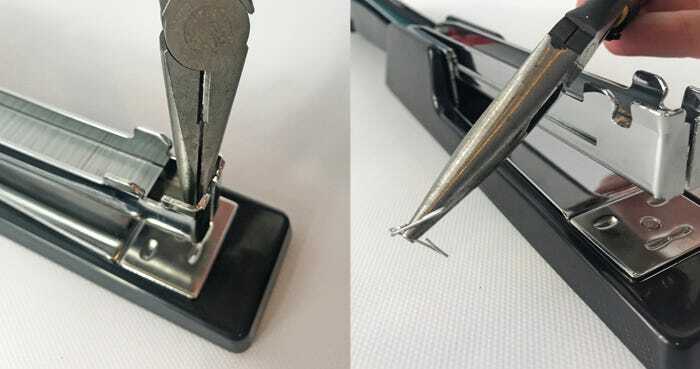 A paper clip is the perfect size for picking at a jammed stapler. The method is the same as above, trying to loosen it up so it falls out of the magazine. Handy in many ways! The ends of scissors are slim enough to where they can slide directly down into the opening of the stapler, forcing the jammed staples out. Who would have thought a staple remover would be a fitting tool to remove a stapler in a staple jam? It really is perfect. Plus, many times they feature a magnetic tip so it automatically catch the staple! 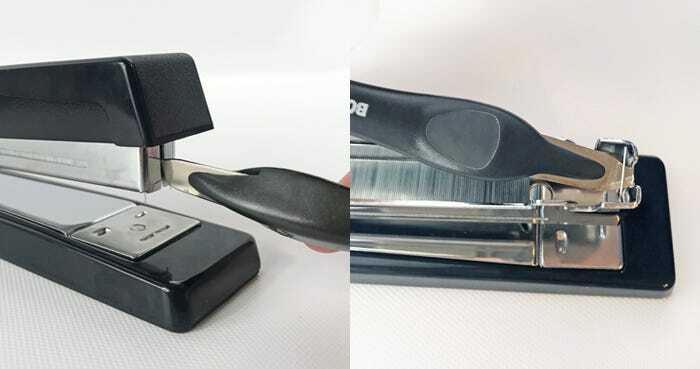 Pliers allow you to really get a grip on the staplers you're trying to extract from the stapler. They too may feature magnetic ends, making it easier to lift the staple out. Hopefully this helps those of you who struggle with frequent staple jams. Have a Bostitch stapler you're unable to unjam? Contact us and we'll be happy to provide further assistance! I have a Stanley Bostitch the one to stable booklets (at least thats my intention) and every 1 time I staple I need to open and close the top or else it jams. I am not happy doing this when I am short on time and need to do this a million times per hour...please send me a solution. and we have an electric stapler on hand, model no. HD-12N/24, where the front/top piece is not movable. Any tips on removing staples on such a machine? Product picture on the above.